Learn.Genetics - check it out! I’ve posted lots of links to Learn.Genetics in the past, and even nominated it, against this site, for an Edublogs Award this year. Now it looks like it needs a bit of help to retain its funding. If you’re a teacher or student who uses the resources there (they are brilliant), then send a quick message of support. The rest of this post is a re-post of an email they sent out. “We’re writing to urge you to let the NIH know how important the educational materials and resources we provide on Learn.Genetics and Teach.Genetics are to you and your students. YOUR MESSAGE MUST BE RECEIVED BY MONDAY, DECEMBER 20. The US National Institutes of Health (NIH), which provides major funding for the Genetic Science Learning Center’s Learn.Genetics and Teach.Genetics websites, is discussing a potential reorganization. This could affect the Science Education Partnership Award (SEPA) program that has supported development of many of the materials on our sites, as well as our teacher professional development programs. Example: I’m writing to ask you to protect the funding and integrity of the NIH NCRR Science Education Partnership Award (SEPA) program, which has provided major funding for the Genetic Science Learning Center at the University of Utah. Examples: I regularly use the (name some of the specific materials) on the Learn.Genetics and Teach.Genetic websites with my students. I’ve participated in teacher professional development (workshops/courses) on (list topic or topics). 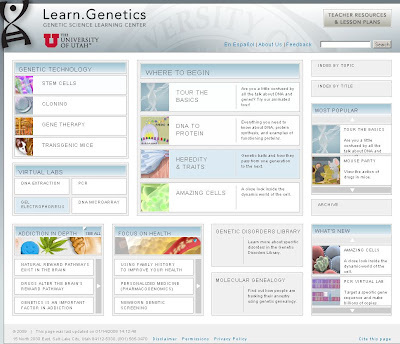 Examples: Use your own words to describe why/how the interactive, multimedia materials on Learn.Genetics help students better understand a specific topic(s), increase student achievement, etc. Use your own words to describe why our materials are important to increasing science literacy. This is a chance for citizen action to make a big difference. Please help! Please forward this message to colleagues. The more people who write to the NIH, the more powerful we will be. Posted on December 19, 2010, in Uncategorized. Bookmark the permalink. Leave a comment.